View of those viewing the view from the Shard. Looking up, there's still plenty of Shard above the viewing galleries. The perfect daytime imagery helps with the view, even on foggy days. The View From The Loo. 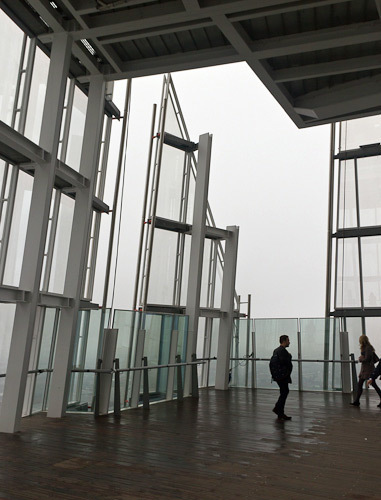 The finishing touches are now being put in place for the opening of The View From The Shard next month. 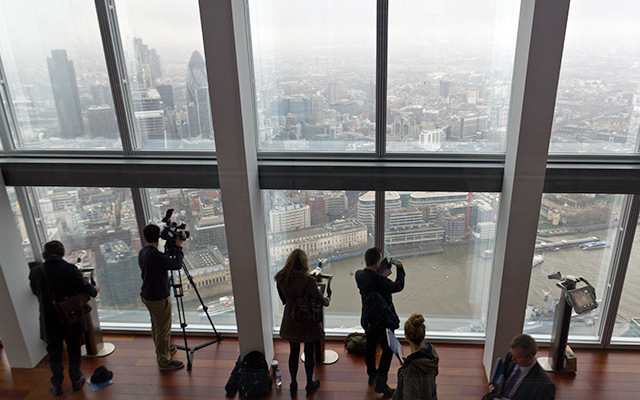 We, and every other media organisation on the planet, spent some time up the top of the Shard this week. Embargo now lifted, you'll be hearing plenty about the Shard over the next couple of days. Rather than give yet another regurgitation of the press release, we'll limit ourselves to a few observations. For a more narrative account of The View From the Shard, see the Guardian, Telegraph, BBC, and pretty much any other news site of your choice. The entrance atrium at the base of the tower sends mixed messages. Opening impressions are of a big, brash American building. Indeed, the first thing you glimpse is the date and time flashily displayed US-style with day and month switched round. Comforting to overseas visitors, perhaps, but that's going to really grate with Londoners. The slight to British sensibilities is thereafter remedied with a wonderful tableau of surreal and humourous London celebrities past and present. Christopher Wren, Richard Rogers and shard architect Renzo Piano build a sandcastle on the Thames with Prince Charles. Queen Victoria queues at an ice cream van. All good stuff. Standard adult ticket price is £25. However, blasé cashsters with deep pockets can turn up without booking and pay a whopping £100 for an on-the-spot ticket. 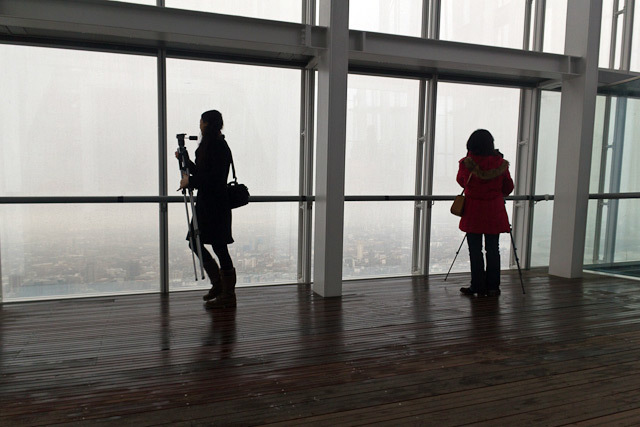 There are two viewing floors. 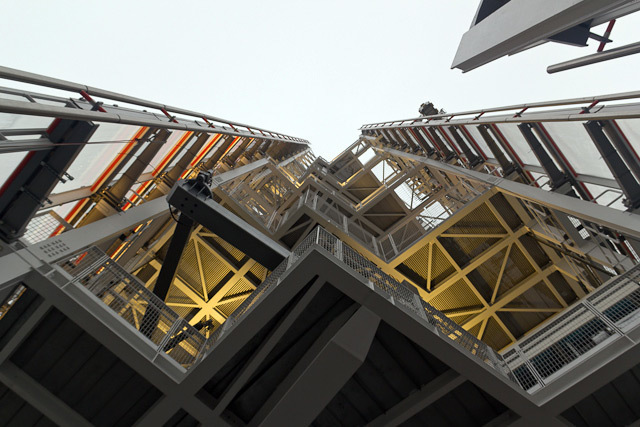 Level 68 offers 360 degree panoramas in a totally enclosed space; Level 72 is mostly open to the elements. Suffer from vertigo? You'll probably be OK up here. 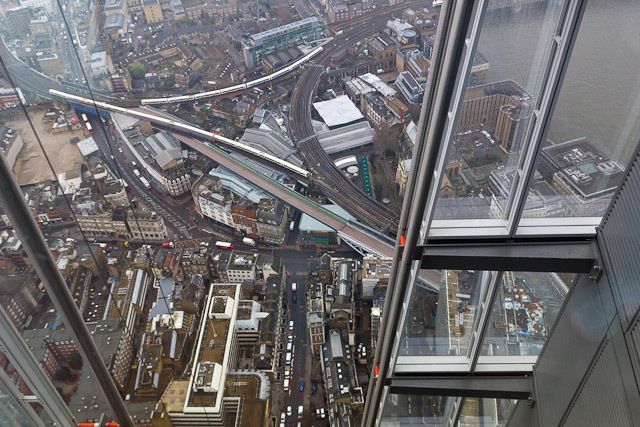 Although it's floor-to-ceiling glass, and partly open terrace, the View From The Shard feels sturdy, strong and secure (which it obviously is). We were able to walk right up to the glass without the slightest trepidation. Level 68 contains the much-talked-about digital view finders. These let you zoom in on any part of the capital in real time, or switch to either perfect day-time or night-time imagery. These are fun. You can click on different buildings to find out what they are. Pedants will enjoy spotting the many (and it is many) errors. Central St Giles has shifted to Shoreditch; St Dunstan-in-the-East becomes St Dunstons; the ancient fortifications are labelled as Romans Wall. It's hilariously slapdash and amateur, and we hope they don't correct it, just so there's a bit of raggedness in an otherwise highly polished experience. Some of the clickable buildings included in the view finders are satisfyingly obscure. This, in part, is the result of a public competition judged by Dan Snow. The winning additions were: Burgess Park lake, Temple Church, Leadenhall Market, Senate House, St Vedast alias Foster, The Wapping Project, Abbey Mills pumping station, Severndroog Castle, Eltham Palace and Wilton's Music Hall. There are a surprising number of additional floors above the viewing galleries. Most of this is dedicated to lift machinery and other services, but we're told there are additional (off-limits) rooms up there. The Shard representatives were coy about revealing their purpose, and left us with a teasing comment that "They're not open to the public...yet". The toilets are going to be a major talking point. We can't think of any other khazi in the capital where you can take a dump while watching the tourists potter around HMS Belfast. You can stay up on the decks as long as you like. However, there's no seating or refreshments so you probably won't linger beyond an hour. We happened to pick a day during which visibility was poor. This is always going to be an issue with a viewing gallery, and visitors who've paid £25 for the privilege might feel a little miffed. Those who book on the very worst days will be offered alternative dates, but no refunds will be given. Our overall opinion? Yeah, we reckon you should probably go try this. It's a bit of a gamble with the weather, but if you catch it right you'll have a day out to remember. 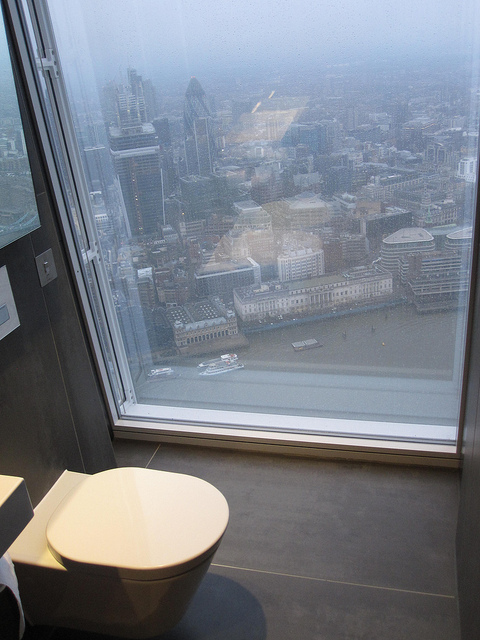 Even in bleak conditions, some joy can be had from the views of the nearby City across the river and, of course, that interesting toilet outlook.£25 is a lot of money for an hour's experience, but it's on par with places like the London Dungeon and Madame Tussauds. 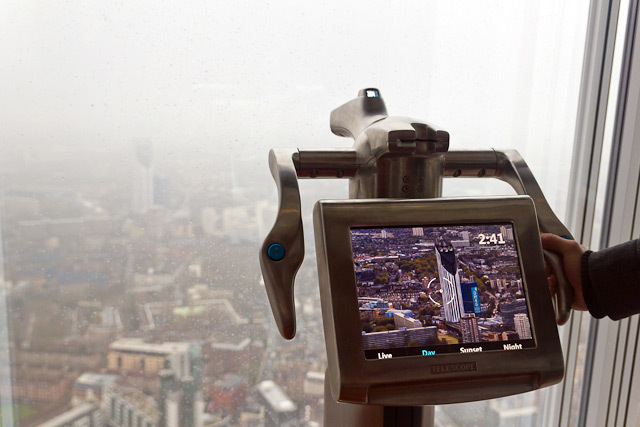 The View From The Shard opens to the public in February, but ticket booking is already open. Follow them on Facebook. Images by Dean Nicholas and the toilet-snapping Zoe Craig.